How to Plan NOW For Your Chiropractic Practice Sale or Transition! Don’t spend decades building a business only to give it away in the end! If you want to sell your chiropractic practice, transition to an Associate or just slow down as you head towards retirement, the time to plan is NOW! And the updated, expanded and revised 2nd edition of the best-selling transitions program in the chiropractic profession can show you how to plan now so that you can maximize the value of your practice and minimize costly mistakes! Did you know that most DC’s fail to plan for their retirement or transition and actually sell or leave at the absolute worst time for the least amount of money! Do you have a concrete game plan in place for how you will leave chiropractic? Does your business planning include an exit strategy, succession strategy or any strategy? Would you like to be able to take some time off periodically, repeatedly or extend vacations? How would you like to sell your $400K per year practice for $766K? Who is going to run your practice if/when you are injured, disabled or dead? Did you know that most practices are currently selling for a fraction of the asking price? Do you want to risk your entire life’s work by waiting to the end of your career to plan? Are you tired, hurting or just plain “burnt out” because you see no end in sight? Do you dream of taking time to be with family, but never have the time or $$ to do it? Are you aware that selling, hiring an associate or dying are NOT the only retirement options? How would you like to create a plan that can multiply the profits gained during your exit from chiropractic — whether you are months, years or decades away from retirement? Even better still — what if you could set a plan in motion TODAY that will allow you to work less hours but retain profitability, or gain a lump sum payout for the established “earning power” of your practice or just flat out head to the beach for a month without your practice floundering in your absence? Why would anyone spend 25-30 years building a business and then give it away? By age 65, only 8% of all chiropractors can afford to retire and maintain their present lifestyle. While we make incomes that are above average for many people in this country, our debt load, poor financial planning, our business structure and our exit strategy (or lack of it), has most of us scrambling to find money to retire in the same manner as everyone else. Fortunately, there’s a way to be in that select 8% even if you’ve “blown” almost everything up to this point in time. Yes, there’s an overlooked asset – if you will – that you are presently missing. And it’s one you have been building for the last several decades of your life. In fact, most chiropractors retire and leave “money on the table” because they miss this “golden opportunity” — and they literally GIVE AWAY what they have spent their life building. Even if your practice does not post numbers up in the stratosphere, your planned efforts towards transitioning your practice WILL definitely result in a greater return than simply leaving things to chance. Despite the obvious consequences and risks, according to statistics from the SBA, that is exactly what the vast majority of small business owners (chiropractors certainly included) do — they leave their entire life’s work to chance and risk giving it all away — by not planning! I’d like to share with you a system whereby you achieve maximum profits for your practice sale or retirement transition from chiropractic before (and as) you retire. The net result being, your practice can sell for three to four times its value. Truly, the sum of the parts ARE worth more than the whole IF you have the right system in place so that you can massively and profitably increase your options!! And even if you decide not to sell (or not right now) — if you would like to slowly transition out or work in some other creative capacity, you need a strategy and a plan to get you there. 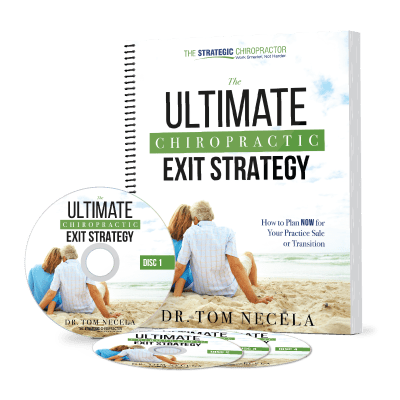 The Ultimate Chiropractic Exit Strategy hand-delivers you the tools necessary to create that plan and gives you step-by-step techniques for crafting the perfect solution, the “ultimate” strategy that will suit your personal needs and financial goals! Good news – with planning, your results CAN be different! These options (and more!) are all possible and are just some of the concepts you will learn in our groundbreaking program entitled, The Ultimate Chiropractic Exit Strategy. What one vital ingredient is necessary for success in your sale or transition? Want to take a month off? Work fewer hours? Manage less? You CAN! Decrease your overhead 5%, 10%, 25% or more! The 18 month trial period… why? The “magic-formula”: ½, ⅓, ¼. It’s simple… but brilliant! Why you don’t need to be retirement age to start with this system! default or non-existent exit strategy. That’s $547 worth of materials — now available at the low price of only $299! Get the Revised & Expanded Edition, published April 2017! The chiropractic practice sale and transition marketplace is changing significantly. Get the latest edition which reflects “what’s working now” so that you be best prepared to use strategies that will help you succeed today and not rely on the same tired old advice the so-called “experts” have been giving for the last 20-30 years! So, what are you waiting for — the longer you fail to plan, the more you plan to fail — get the Ultimate Chiropractic Exit Strategy today!